What’s up, under or behind there? 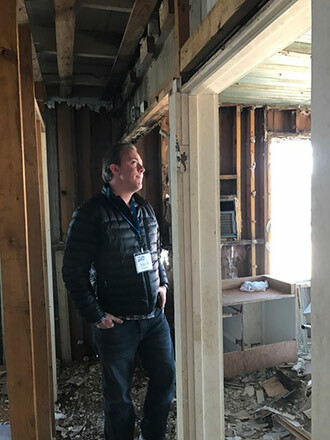 Those questions were posited at every turn this past Saturday when Julie Dodson, interior designer for the Country Cottage Idea House caught her ﬁrst look of the old house that she’ll be renovating. Meeting with Compound owner/developer Mark Massey, builder Lewis Tindall and me, she wasn’t as shocked as we thought she might be. The house’s raw condition is (understatedly) a bit rough. Consider that it has been languishing in a pasture for double-digit years, home to nothing but what the environment dishes out. Wasn’t a pretty sight. Before getting down to business, there was lots of joking around about what could be saved….like the stylish harvest gold shag carpet, and the beneﬁt that a quick shampoo might do. Or, the huge overstuffed ﬂoral sofa and side chair, now hosting who knows what manner of vermin (we all gave the ensemble a wide berth). Oh, and that linoleum! You know, the kind that mimics the old world tile one might see in a south-of-the border hacienda? Lovely. Quickly, the conversation turned to the real, ﬁrst work, to be done. Knocking out walls, seeing what was behind them, and how the new space created would be treated. In the bedroom, the character of beautiful old bead board lay partially exposed through the ceiling’s disintegrating sheet rock. We could see it was intact with striations of that old grayish blue/green paint so characteristically used by the Germans who settled here in Fayette County. “It would be great if the entire ceiling was like this; I’d love to work with that,” said Julie. In the living room she mused about what might be beyond the sheet rock that blanketed the ceiling. Always at the ready to oblige, Mark took out a pocket knife and surgically prodded pieces loose. Lewis, meanwhile, picked up a crowbar and began jamming it into the ceiling with gusto, dust ﬂying in all directions, right along with nesting wasps. It was quite a moment of contrasts set amidst choking laughter and Julie and I ﬂying to opposite corners of the room seeking clear air. To our delight, Lewis’s enthusiastic demolition had revealed beautiful wide original boards and beams. All will be saved and restored, expanding the height of the room signiﬁcantly where the sheet rock had closed it in, catastrophically. Outside, Julie continued the inspection, noting the details of original construction that had made it through the years in good stead. Pulling out her color chart, she decided the exterior color palette. Before that paint is ordered though, the next order of business is getting two roll offs on site…those mega dumpsters that will ferry away the debris of ages as the real demolition begins. Stay tuned.